John Buchan’s 1915 adventure novel The Thirty-Nine Steps, with its dashing hero Richard Hannay, is just a bit of fun – isn’t it? Well, it’s fun all right, but behind it there lays a pretty clear political agenda. Most obviously it’s anti-German, with the plot revolving around a devilish Teutonic plot to steal British military secrets. But there’s also a strong imperial dimension. You find me in the deuce of a mess, Mr—by-the-by, you haven’t told me your name. Twisdon? Any relation of old Tommy Twisdon of the Sixtieth? No? Well, you see I’m Liberal Candidate for this part of the world, and I had a meeting on tonight at Brattleburn—that’s my chief town, and an infernal Tory stronghold. I had got the Colonial ex-Premier fellow, Crumpleton, coming to speak for me tonight, and had the thing tremendously billed and the whole place ground-baited. This afternoon I had a wire from the ruffian saying he had got influenza at Blackpool, and here am I left to do the whole thing myself. I had meant to speak for ten minutes and must now go on for forty, and, though I’ve been racking my brains for three hours to think of something, I simply cannot last the course. Now you’ve got to be a good chap and help me. You’re a Free Trader and can tell our people what a wash-out Protection is in the Colonies. All you fellows have the gift of the gab—I wish to Heaven I had it. I’ll be for evermore in your debt. At the meeting, the Chairman is depicted as ‘a weaselly minister with a reddish nose’. Sir Harry (as the young man is called) gives the first speech, which is a flop. He didn’t begin to know how to talk. He had about a bushel of notes from which he read, and when he let go of them he fell into one prolonged stutter. Every now and then he remembered a phrase he had learned by heart, straightened his back, and gave it off like Henry Irving, and the next moment he was bent double and crooning over his papers. It was the most appalling rot, too. He talked about the ‘German menace’, and said it was all a Tory invention to cheat the poor of their rights and keep back the great flood of social reform, but that ‘organized labour’ realized this and laughed the Tories to scorn. He was all for reducing our Navy as a proof of our good faith, and then sending Germany an ultimatum telling her to do the same or we would knock her into a cocked hat. He said that, but for the Tories, Germany and Britain would be fellow-workers in peace and reform. I didn’t get on so badly when it came to my turn. I simply told them all I could remember about Australia, praying there should be no Australian there—all about its labour party and emigration and universal service. I doubt if I remembered to mention Free Trade, but I said there were no Tories in Australia, only Labour and Liberals. That fetched a cheer, and I woke them up a bit when I started in to tell them the kind of glorious business I thought could be made out of the Empire if we really put our backs into it. Altogether I fancy I was rather a success. The minister didn’t like me, though, and when he proposed a vote of thanks, spoke of Sir Harry’s speech as ‘statesmanlike’ and mine as having ‘the eloquence of an emigration agent’. What is going on here? Hannay’s claim to have ‘very few notions about Free Trade’ is disingenuous: he’s obviously of the opinion that it’s absolute rot. It’s no coincidence that later in his career Buchan became a Conservative MP and was a strong imperialist. He ended his career as Governor General of Canada, dying in the job in 1940. In The Thirty-Nine Steps it is his clear intention to suggest that, although some Liberals are decent men, the party as a whole is both sceptical of Empire and simplistic in its well-meaning beliefs. Hannay’s own knowledge of what the Germans are up to exposes Sir Harry’s message as dangerously naïve. Furthermore, the book clearly references the pre-World War I free trade-versus-protection controversy. The Liberals had won a landslide majority on a free trade basis in 1906, but the issue remained live. 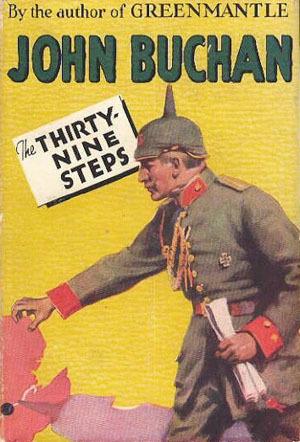 The Thirty-Nine Steps, then, was not only a stirring adventure story; it was part of an imperial backlash against what Tories saw as the outdated and superficially idealistic nostrums of Liberal Edwardian Britain. Having recently watched ‘Riddle of the Sands’, found this most interesting. Thanks.